We make 2 types of Granola here, both refined sugar free but one does have a small amount of honey, so you do need to mindful of that if you are watching ‘fructose’ intake! Granola is so easy to make, if you can get into the habit, then you’ll never buy shop bought again. Once made, store it in an airtight container and it will keep for a good two weeks-that is, if it lasts that long! 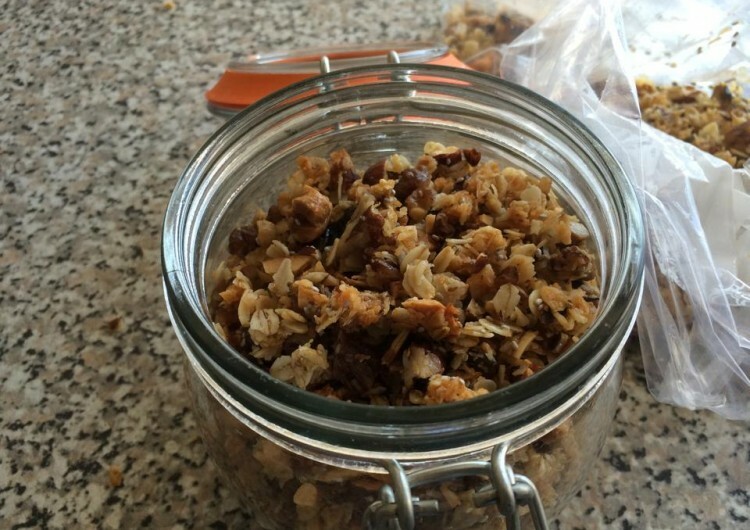 My go-to Sugar Free Granola of choice is the Coconut Granola, recipe courtesy of Sarah Wilson of ‘I Quit Sugar’ fame. I really like her recipes and follow a lot of what she suggests. Do keep a close eye as it can catch! You can always ring the changes by adding some chopped dried fruit-but do keep in mind that dried fruit is very high in natural sugars, so for me, I always keep this recipe as it is and add in the dried fruit to the granola that has some honey in it already-I’ll share that recipe next time.